The final section of a trail connecting Bright Pond Lane to Stones Throw Drive was completed in October 2001. 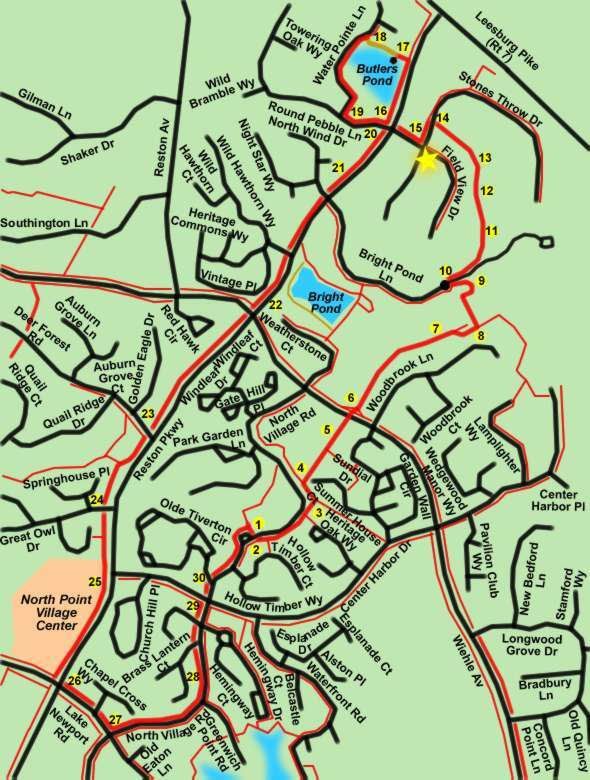 This walk utilizes that link to take you to Butler’s Pond, Reston’s most northern pond. Along the way we will show you how a sediment basin helped to reduce downstream flooding after an unusually heavy rainfall. The walk starts at North Hills Park. It is located on North Village Road about 3 blocks north of Center Harbor Drive. Parking is available on North Village Road. Cross North Village Road at the picnic area and follow the wide asphalt trail north on the east side of that road. The trail will pass 2 narrow asphalt trails to the right. At the next wide asphalt trail intersection turn left to follow North Village Road for a short distance. Turn right onto the wide asphalt trail leading through the meadow away from North Village Road. This will be just prior to the small stream crossing. The trail goes under Wiehle Avenue. After Wiehle Avenue the trail jogs slightly to the right but continues in the original direction following a stream. After a distance turn right onto the wide asphalt trail. The trail going straight is a dead end. The trail turns left over a dam. The dam is part of a sediment basin that is built to trap soil and debris. Place the mouse over picture 8cd to view the ground before and after a heavy rainfall. Picture 8e shows water entering a small pipe at the base to the outlet fixture prior to the dam. Since there has been a heavy rain the water flow in the pipe is at capacity. Normally the inlet pipe would be able to carry the streams full water flow. The outlet pipe leading from this fixture under the dam is much larger and can carry all the water that the small inlet pipe can deliver plus water that might enter the top of the fixture under extremely heavy flooding. Much of the soil and debris carried by the rapidly moving waters are deposited in the area prior to the dam preventing it from traveling further downstream. Limiting the flow of water past the dam also helps to reduce flooding further downstream. The trail turns to the right from the dam and then loops back following a private drive to Bright Pond Lane. At Bright Pond Lane cross the private drive and take the new asphalt trail following the private drive down the other side. The trail turns left to enter the woods. The trees are not so dense in this section of the trail. The trail enters a grassy area behind homes. The trail intersects with Stones Throw Drive. Cross the street and turn left to follow the wide asphalt trail on the other side. Turn right at Field View Drive to follow the wide asphalt trail along that street. Cross Reston Parkway and turn right to follow the wide asphalt trail along the other side. Butlers Pond will be on the left. At the end of Butlers Pond turn left to follow the wooden steps and boardwalk along the side of the pond. The walkway leads to a gazebo. From the gazebo follow the natural surface path that has been cleared through the meadow alongside of the pond. The path intersects with Water Pointe Lane. Turn left and follow the sidewalk along that street with the pond on your left. Turn left at the intersection with Round Pebble Lane and follow the sidewalk along that street back to Reston Parkway. Turn right at Reston Parkway and follow the wide asphalt path south along that road. The path approaches North Wind Drive. Continue along Reston Parkway. The path continues along Reston Parkway as it crosses Wiehle Avenue. The path crosses Deer Forest Road. Continue along Reston Parkway. The path crosses Great Owl Drive. Continue along Reston Parkway. The path crosses the entrance to North Point Village Center. Continue along Reston Parkway. At the intersection with Lake Newport Road turn left and cross Reston Parkway. Follow the wide asphalt path east along the north side of Lake Newport Road. At the intersection with North Village Road turn left and follow the wide asphalt trail along that road. The trail continues along North Village Road as it approaches Brass Lantern Court. The trail intersects with Center Harbor Road. Cross that street and continue along North Village Road on the other side. North Village Road swings slightly to the right at the intersection with Olde Tiverton Circle. Continue along the wide asphalt trail along North Village Road to the conclusion at North Hills Park.